I have been contemplating today my experience as a playing child, growing up in Brisbane in south east Queensland, Australia. 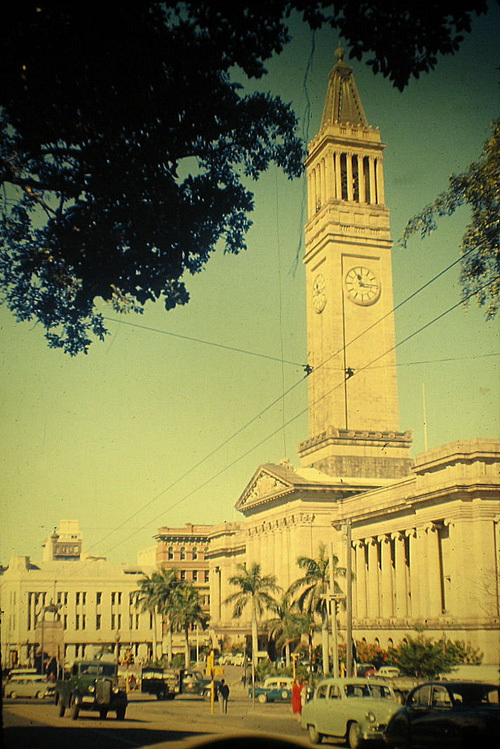 Brisbane in the 1970’s was a great place to be a child, and this had a lot to do with the abundance of swimming pools and the warm tropical swimming weather that persists for about 9 months of the year. More specifically, though, I had access to two landscapes that were instrumental in my development as a creative individual, and in shaping my relationship to the city and the environment in general in adult life. These were known to me respectively as ‘the creek’ and ‘the city’. 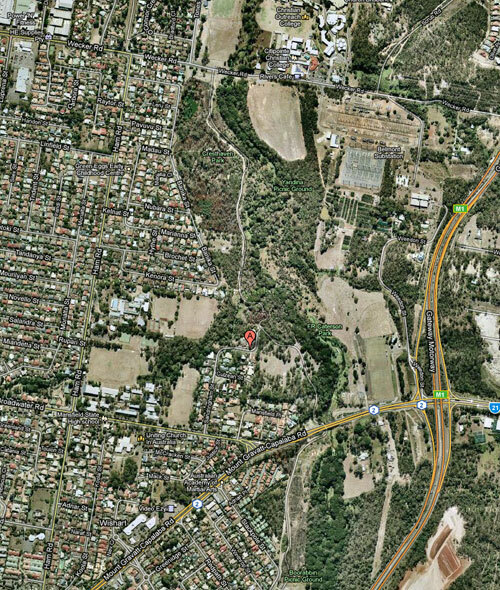 ‘The creek’ was the Bulimba Creek, which winds through Southern Brisbane’s outskirts in rough bushland, or at least it did when I was a child. It has been largely contained by now, and lost its sense of endless extension into bush. In the photo above you can see that it is now more clearly bounded by developed areas - the creek is the trapezoidal green space in the middle of the photograph. My old house is indicated by the pink marker. The creek was a landscape of wonder and endless discovery, and held such exciting features as the Mysterious Cube (a vast, rusting steel boiler canted on an angle in the actual bed of the creek); a number of rusting car bodies in different locations; the Big Tree that had fallen across the creek, providing an excellent and useful bridge; and slightly further afield, The Cliff, an escarpment around a gully. Even further afield - as far as Wecker Road, if you could bother to walk that far in the heat - you could find the Ruined Farmhouse, visiting which seemed illicit in some ill-defined way. These landmarks loomed large, and their presence in the landscape of the creek was totemic, or mythological. It is not that I thought they were magical - it is just that they were definitive features, wholly specific, and more than a little dangerous in each their different ways. They were there, and they were a bit wild, and that was enough. I would return home from School and go ‘down the creek’, and thus spent hours wandering the hidden tracks and paths, finding bolt-holes and uncovering those aspects of the place that were far from obvious to the casual (adult) observer. There was a tightly defined circuit, a network of paths that could be traversed, and many branches that could be negotiated to arrive at various destinations, each of which had a particular character different to the others. The bushland had fingers radiating into the surrounding suburb, and by navigating the creek paths you could get yourself to nearly anywhere you might want to be, passing into bushland here and out again there as if negotiating secret passages in an old house. In fact, it felt a lot like doing just that: a parallel world that had branches and outlets everywhere in the ‘real’ world, a way of bypassing the everyday and moving in secret. If this was the home ground, its opposite number, no less exciting, was Brisbane City itself. At the relatively young age of 11 or 12 I was allowed to hop on a bus and go ‘downtown’, and having done so for years with my grandmother and mother, I could then visit the various different landmarks and territories of the city on my own, exploring at will. Brisbane has some grand architecture, and I was particularly drawn to the older sandstone buildings that were extroverted and urbane, buildings such as the Macarthur Building on Queen Street and the Brisbane City Hall on King George Square. I would enter City Hall through the big doors, between the bronze lions, and walk the circuit right around the hall looking at the Alderman’s names stenciled on the glass in gilt letters, from the Mayor’s office to the various other chambers and spaces. I remember liking the fact that you could walk all the way around in a circuit and lose track of where you were, with doors to the offices on the outer side and doors to the great assembly hall on the inner side. Little did I know that years later I would be a close friend of the architect’s great grandson, David Bullpitt, himself an architect of no small ability. The City provided the opposite of the creek in most respects, but in one respect they were identical: they both possessed a sense of danger, and a sense of the illicit, or forbidden. Need I say that this was their chief appeal? To a bookish, church-going little boy, both landscapes, and my pronounced freedom within them, offered endless possibilities. I am now 39 years old, but the totemic influence of these two landscape archetypes is still strong for me. I am fascinated by their psychological importance to me even now. I now live in the inner city of Melbourne, right on the downtown grid, and it still gives me an ill-defined thrill, even if the ‘city’ of Melbourne is less ‘urban’, in its physical setting and atmosphere, than downtown Brisbane seemed to me as a child, with its dramatic plunge down into the River. I sincerely believe that I could only truly feel at home living in one of the two archetypes from my childhood: a bushland setting, or the absolute inner city. Or, as a friend put it once, ‘either completely out or completely in’. Certainly I have gravitated to those extremes as an adult; for now I am living the latter condition, but perhaps at some point in my life I will revisit the former. It seems to me that a life spent moving between the two is nothing to regret.